For the last few years, even before being vegan, I’ve been focusing more on homemade Halloween goodies rather than store bought candy. Partly because of the long ingredient list of additives, artificial colors and flavors, partly because I love baking, and partly because everything tastes better when it’s made with love! It’s not that I wouldn’t eat (vegan) Halloween candy again--although I’m sure I’ve had my fill from trick or treating until I was 20 (I was very enthusiastic)--but I’d rather spend the day making a few fun treaties for my family and I to eat while we watch a whole bunch of scary movies on Halloween night! For this project, I used a mini cupcake pan so that the cupcakes wouldn’t be too big, more like bite sized, and would also be able to sit nicely on a tray for displaying. 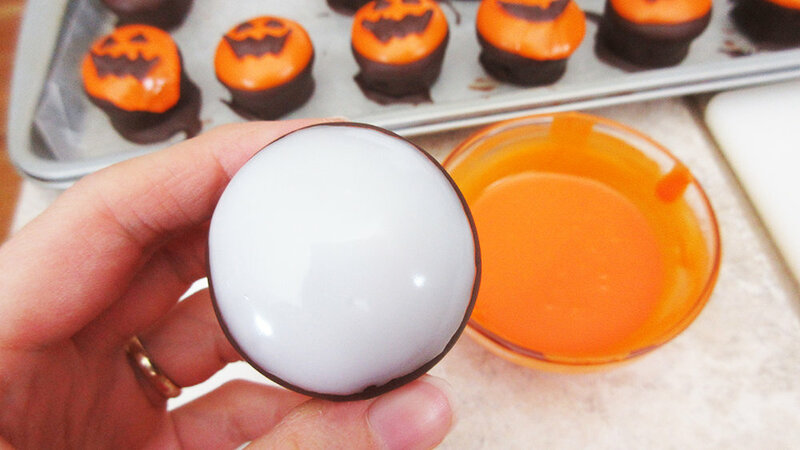 The mini chocolate covered Halloween cupcakes are made up of a yellow crazy cake for the cake inside, dipped in chocolate, then dipped in icing, with little chocolate shapes placed on top for the face! They’re super easy to make and would be fun to do with kids or bring to a Halloween party! I love that when you look down at them they just look so cute and happy! I wanted the cupcake faces to be somewhat uniform so I created a template in Adobe Illustrator to use when piping the chocolate onto wax paper. I found this much easier than trying to freehand it, but feel free to have fun with it and do your own thing! Click the download link below to download my template. I do ask, if you download my template, please keep it for personal use only. Place mini cupcake liners in your mini cupcake pan. For round cakes grease your pans with coconut oil with the option of using parchment paper on the bottom. For mini cupcakes, I place one pan at a time for about 20-25 minutes. For 9 inch round pans, bake for 30-35 minutes depending on your oven. The cake in any pan is done when an inserted toothpick comes out clean. Let cool completely before icing or covering in chocolate. Set up some kind of double boiler. As usual, I’m using a little metal bowl over a little metal pot. The bowl doesn't fit in all the way or touch the bottom of the pot. Fill the pot with about ¼ - ½ cup of water. Put your bowl or double boiler on top and add your chocolate chips, cooking over low heat, stirring occasionally. Once melted add your olive oil, about a tablespoon at a time to thin out the chocolate. You want your chocolate to be fairly thin so that it covers your cupcakes nicely. I’d aim closer to 3 tbsp of oil but it's up to you! Using a spoon or a tool like this, dip your cooled cupcakes, coating them in chocolate. Refrigerate until chocolate hardens up. I ended up using about 2 bags of chocolate for this project. You can always start off with one bag, melt it down, add your olive oil and use it then if you need more simply add more chocolate to your pot and a bit more olive oil until your happy with the consistency. You also might need to melt down more chocolate before you transfer it to your piping/plastic bag so that you have enough. Transfer your remaining chocolate to a plastic bag or piping bag. Using my template or freehand, pipe little faces on wax paper or parchment paper with a cookie tray or cutting board underneath it for easy fridge/freezer transportation. Let refrigerate/freeze until hardened. Return to the fridge/freezer during decorating as necessary to re-chill. For the icing, I used a simple powdered sugar and water combo with food coloring. It’s super easy! Pour some powdered sugar into a bowl--about 2 cups, add about a tbsp or so of water, and mix well! Add more water or more powdered sugar as needed until you reach a desired consistency. You want it thin enough to dip easily, but thick enough to leave a nice layer of icing. It’s also a good idea to test your icing for dipping to make sure you’ve got the right consistency. You don’t want to dip a whole tray of them to only find that it slides off because it’s too thick or thin. So when the chocolate on your cupcakes has hardened try dipping one and see what happens. Adjust from there. You can do this! Dip your chilled little chocolate covered cupcakes into the icing, coating the top of the cupcake. Next, carefully peel and place some chocolate shapes to make a face! Tip: When working with chocolate keep a frozen ice pack on the counter. Then, in between two or three cupcakes you can chill your fingers (wiping off any excess water onto a tea towel), preventing the chocolate from melting onto your hands when dipping and placing faces. It makes such a difference! Ice cubes and/or cold water would also work! Once you've got your batter all ready to go, line your cupcake tray with cupcake papers so they'll be easy to remove. I really love using these Wilton spoons, they've come in handy all the time since I got them! Peel off all of the cupcake papers before dipping! Put your chocolate chips into your double boiler set up and start melting your chocolate. My goodness, don't mind my chocolate chips, they were a little dry--but they still tasted amazing!! This was a good consistency but thicker wouldn't have been a problem either, so it's up to you! You could always dip one or two then let them chill and see if you like the results. I wouldn't blame you if a few cupcakes got eaten in the process--taste testing is important too! When dipping, use a spoon to spoon the chocolate onto the cupcake when your chocolate gets low. When the cupcake is coated tap your spoon a little on the side to get rid of any excess chocolate. You could place them on a wire rack instead of wax paper if you're not a fan of the chocolate pooling. I personally like it because it's like bonus chocolate! Now they've hardened from the fridge. I've transferred my remaining chocolate into a piping bag. If your chocolate hardens when you take a break you can simply pop it into the microwave for about 10-15 second. Or you could pinch off the end and hold the top closed so you can run it under hot water. This part is like drawing with chocolate, you can use my template or freehand it, it's up to you! Here they are after being in the freezer for about 20 minutes. Now we're on to dipping! Simply dip your cupcake into your icing, being mindful not to dip too far or your icing may run off. After you've dipped a few, 3-5, start adding the faces! If you're worried about melting because your home is warm, put the tray of cupcakes and the tray of face shapes back into the fridge or freezer--lol whichever has room! And holey-moley-pumpkin-pie you’ve got yourself some mini chocolate covered Halloween cupcakes that taste like doughnuts! My goodness! Look at those little cuties! I hope you guys enjoyed this post! I know my family and I sure enjoyed eating the results! What spooky food do you have planned for Halloween? Next week I’ll be posting another Halloween-riffic baked good item! I can’t wait to show you guys! I hope you all have a wonderful weekend and get a chance to indulge in making some of these cute Halloween cupcakes!